What a beautiful book. Probably one of the best books I've read this year and one that I am going to recommend to everyone. As I read it, I kept on thinking my friends coming to Nigeria for the first time, as well as Nigerian friends returning home, definitely need to read this. 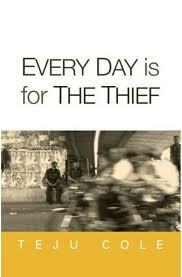 Every Day is for The Thief is an account of a Nigerian returning home after many years in the States. It is part-fiction, part-memoir, and explores the narrators experience of contemporary Lagosian life. Every Day is for The Thief is an accurate description of Lagos. From getting a visa at the New York Consulate (I experience that every time at the Nigerian High Commission in London), to the airport and immigration, to finally being in Lagos and experiencing it flaws and all - the power cuts, the noisy generators, the traffic, the bus conductors, the unloved National Museum (and its depiction of the slave trade and Nigerian military rule), the CMS bookshop with very little to offer, the overt corruption, being threatened by 'area boys', and the low salaries. Through it all the narrator feels like a foreigner and tries to see where he fits in it all. He does manage to find glimmers of hope - a lady on the bus reading Michael Ondaatje, the MUSON centre, which in stark contrast to the National Museum is well taken care of, and the Jazzhole selling a broad selection of music and books, including the Michael Ondaatje book he previously saw the woman on the bus reading. Even within these beautiful moments, Nigeria's corruption still persists - a jazz shop sells pirated copies of their expensive CDs and the MUSON centre has a music school where African teachers are paid less than foreign teachers, and where only the privileged can really learn - as you have to have your own piano, violin or cello to be taught. This is one of the best books about contemporary Lagos life I have read. There's even a chapter on the slave trade in Nigeria. Even better, I no longer need to explain to my friends what my time in Lagos has been like so far. All I need to do is recommend this book. My only one issue with the book is that it was too short. I wanted more. I didn't want it to end. I know Open City has received rave reviews but this is a tiny gem of a book. It really was and yes, it was published by Cassava Republic. It wasn't until after your comment that I realised the book might only be available in Nigeria. Is it usually difficult to get books published in Nigeria in Ghana? Wow, this sounds incredible. I wasn't a huge fan of his Open City but I really must try this one anyway. Really? I haven't read Open City yet but it seems to be getting really great reviews. When I eventually read it, it'd be a tough act to follow as I really enjoyed Every Day is for the Thief.